The ISS crosses the sky in brilliant fashion in this image by Dave Nuti. 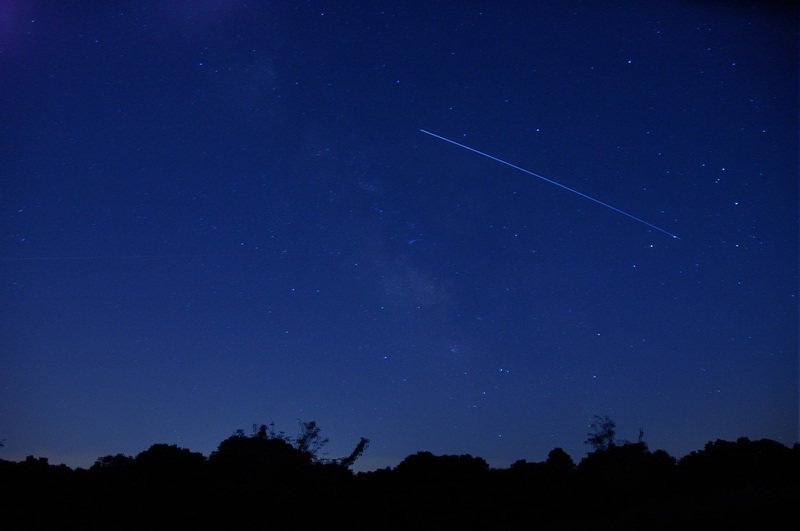 CAA member Dave Nuti was all set to photograph a brilliant pass of the International Space Station visible from Northeastern Ohio the night of August 6, 2012. The pass was to take the ISS across an area near the heart of the Milky Way as seen from here. Nuti’s result was a splendid view of the night sky, galactic star clouds floating, dotted by suns closer in. The image even captured bright patches — star clusters in our galaxy — on that clear night. Constellation fans will notice the “teapot” of Sagittarius just to the left of center, and the stars of Scorpius spanning the left side of Nuti’s picture. Technical Info — Nikon D70: ISO 1600, f/4.5, ~45 seconds, 20mm, August 6, 2012, from Letha House Park, near Spencer, Ohio. Photo by Dave Nuti. This entry was posted in Uncategorized and tagged astrophoto, constellations, ISS, northeast ohio, northeastern ohio, Sagittarius, Scorpius, space station. Bookmark the permalink.